Yoshida Ayumi is a student in Teitan Elementary when Shinichi was enlisted into her class after he had been shrunk by the drug APTX 4869. Shortly afterwards, Ayumi and her classmate Genta had the idea of investigating an apparently haunted mansion. They persuaded Conan to come along, and Genta also personally drafted Mitsuhiko when the latter expressed his criticism about supernatural hauntings. As it turned out, the haunting served as a cover-up for an old homicide case. Following its resolution, the foursome decided to stay together and form the nucleus of what would become the Detective Boys. 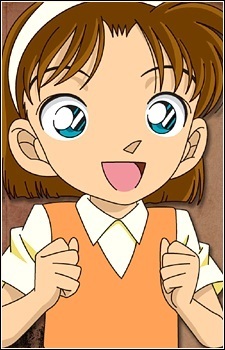 For a time, Ayumi was the sole female member of the Detective Boys until Haibara joined the group. During a case involving a cache of stolen Italian gold coins just prior to the official formation of the Detective Boys, Conan saved the group from getting killed by the Mafioso who were also after the gold, earning Ayumi's gratitude which quickly developed into a serious crush. Ayumi is a naive and innocent little girl who shows courage from time to time and acts as the team's cheerful spirit. She has an open crush on Conan, which makes him uncomfortable, though Ayumi thinks that he has feelings for Haibara because he tries to protect her and she often sees them talking amongst themselves in private. Ayumi later becomes better friends with Haibara, and she allows Ayumi to use the more informal term Ai-"chan" to address her. When on a case, Ayumi often makes really simple observations that allows its progress and resolution. For instance, she unlocked one of the codes from the Momotaro container the Detective Boys found in Kurashiki by deducing that it was most likely referring to one of the statues at the Oohara Art Museum: they had to walk 25 steps from the statue towards the direction it was facing.